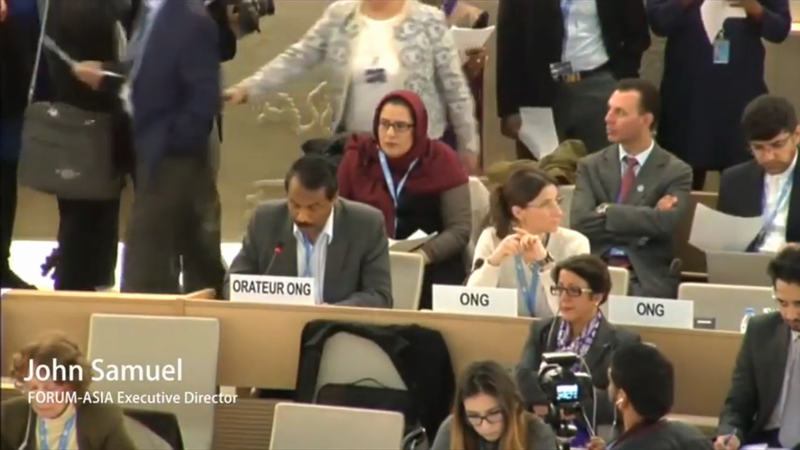 The 34th regular session of the UN Human Rights Council ended on Friday, 25 March 2017. Over the four weeks of the session FORUM-ASIA delivered seven oral statements, sponsored nine side events, spoke at a side event to wrap up the Council session and submitted one written statement, in addition to participation in consultations and bilateral meetings before and during the session. Its advocacy focused on Burma/Myanmar, Sri Lanka, Bangladesh, Cambodia, and the Philippines, as well as on the theme of human rights defenders. FORUM-ASIA also participated in the dialogue on Timor-Leste’s UPR outcomes and on the debate on national human rights institutions. In line with the theme of human rights defenders, FORUM-ASIA organised a consultation for Asian human rights defenders with the Special Rapporteurs on human rights defenders; freedoms of peaceful assembly and of association; and freedom of religion or belief; as well as a reception for them to meet other NGOs in Geneva. 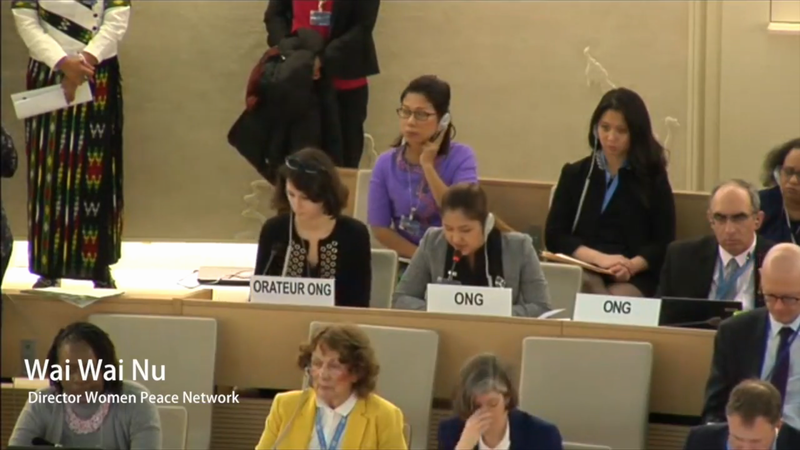 The Human Rights Council passed a resolution to urgently dispatch an international fact finding mission to Burma/Myanmar. Prior to the adoption of the resolution FORUM-ASIA strongly advocated for an independent international investigation that that covers human rights violations against all ethnic minorities, including the Rohingya. During the interactive dialogue with the Special Rapporteur on the situation of human rights in Myanmar, FORUM-ASIA delivered a statement strongly endorsing calls for a COI and urging the government to end its military offensive in Rakhine, northern Shan and Kachin states; grant humanitarian access to all areas; cooperate with international investigative mechanisms; and uphold the equal rights of all. It also mentioned the Myanmar National Human Rights Commission in its statement calling for the appointment of national human rights institutions (NHRIs) to be transparent and participative. FORUM-ASIA organised a side event on conflict, human rights, and human security in the country, as well as co-sponsored a side event on accountability for human rights violations against the Rohingya. The Human Rights Council passed a resolution on promoting reconciliation, accountability and human rights in Sri Lanka. At the session FORUM-ASIA stressed the need for a strong resolution that meets the expectations of victims and those affected by abuses on the ground. R. Iniyan Ilango (United Nations Advocacy Programme Manager, FORUM-ASIA ) delivering an Oral Statement on the reconciliation process of Sri Lanka. At the interactive dialogue following the High Commissioner’s report, FORUM-ASIA delivered a statement calling on the government to urgently address concerns on confidence building and announce a time-bound plan to implement recommendations by resolution 30/1, the High Commissioner’s report, treaty bodies and special procedures. FORUM-ASIA co-sponsored two side events on the report of the Consultation Task Force and the importance of international monitoring. The EU and UK spoke on Bangladesh during the interactive dialogue with the High Commissioner. FORUM-ASIA continues to stress that the Council needs to pay more attention to the situation in the country. FORUM-ASIA raised the situation in Bangladesh in three oral statements throughout the Council session, specifically issues on attacks against secular bloggers, online activists, journalists, and LGBTI activists; legislation used to restrict the work of human rights defenders; and the law that restricts civil society inclusion or public consultation in the National Human Rights Commission (NHRC)’s appointment process. 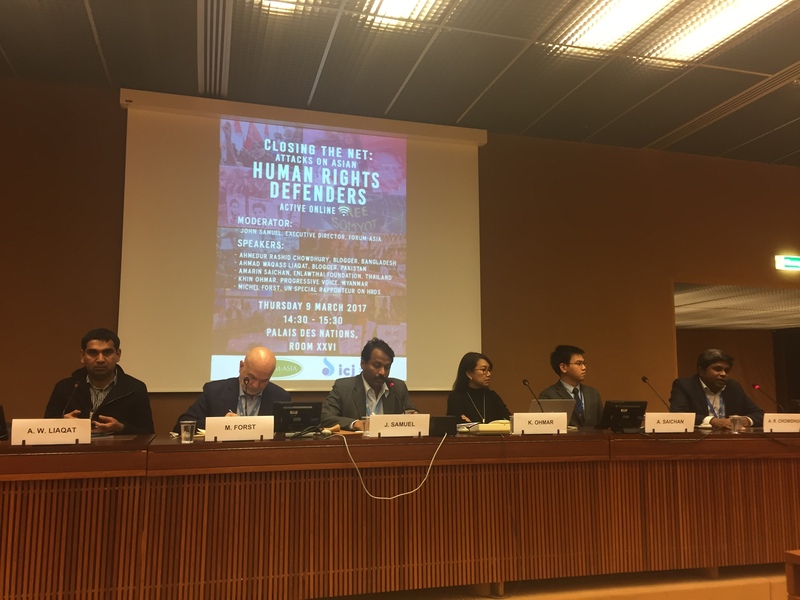 FORUM-ASIA co-sponsored a side event on human rights defence and blogging in Bangladesh, as well as included a Bangladeshi blogger in its side event on attacks on human rights defenders who are active online. Although Cambodia is normally discussed at a dedicated interactive dialogue during the Council’s September session, the High Commissioner, EU, France, Japan, UK, and the U.S. expressed their concerns on shrinking democratic space in the country ahead of the upcoming elections in June. In two statements, FORUM-ASIA called for the release of human rights defenders Ny Sokha, Yi Soksan, Nay Vanda, Lim Mony, and Ny Chakrya, and ending of the judicial harassment of Tep Vanny. It also called for the amendment of all regressive laws. The High Commissioner for Human Rights, EU, Australia, Canada, Czech Republic, France, Iceland, Ireland, U.S., and UK delivered statements on extrajudicial killings in the Philippines, as well as on actions to reinstate the death penalty, lower the minimum age of criminal responsibility, and threats to human rights defenders. FORUM-ASIA added its call to the government to cooperate with the UN and international experts during its statement on human rights situations requiring the Council’s attention. 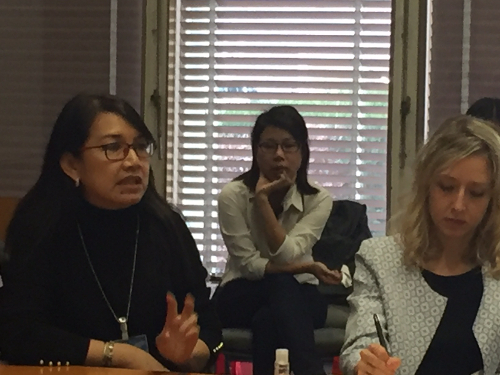 FORUM-ASIA co-sponsored and spoke at a side event on extrajudicial killings in the Philippines, as well as co-sponsored a side event on the Philippines’ UPR. A resolution extending the mandate of the Special Rapporteur on the situation of human rights defenders was adopted at this session. The current Special Rapporteur presented his report earlier in the session as well. At the general debate following his presentation, FORUM-ASIA delivered a statement citing cases from Bangladesh, Cambodia, Malaysia, Pakistan, South Korea, and Thailand. In the joint civil society statement delivered at the end of the session, FORUM-ASIA and other NGOs welcomed the renewal of the mandate of the Special Rapporteur on human rights defenders at a time when defenders are under an unprecedented attack and killings of defenders are on the rise. 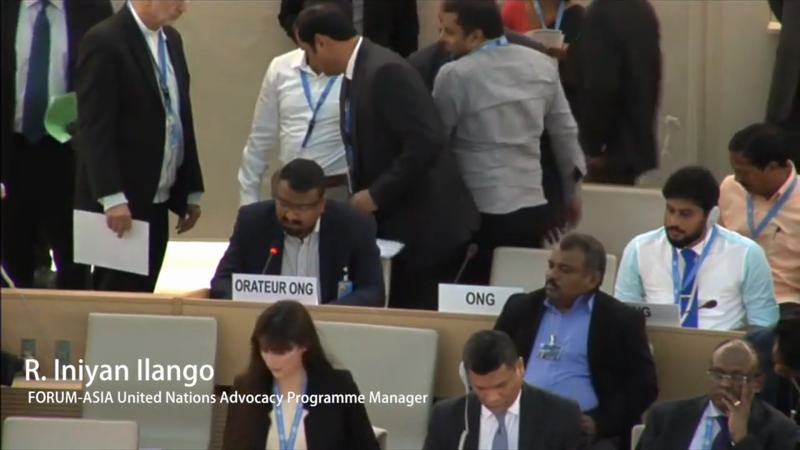 The NGOs also called on the President of the Human Rights Council to follow-up on allegations of reprisals against human rights defenders cooperating with the UN, including cases against defenders from Myanmar and Sri Lanka. In cooperation with one of its members, FORUM-ASIA submitted a written statement on attacks against human rights defenders in India. It mentioned similar threats in one of its oral statements. 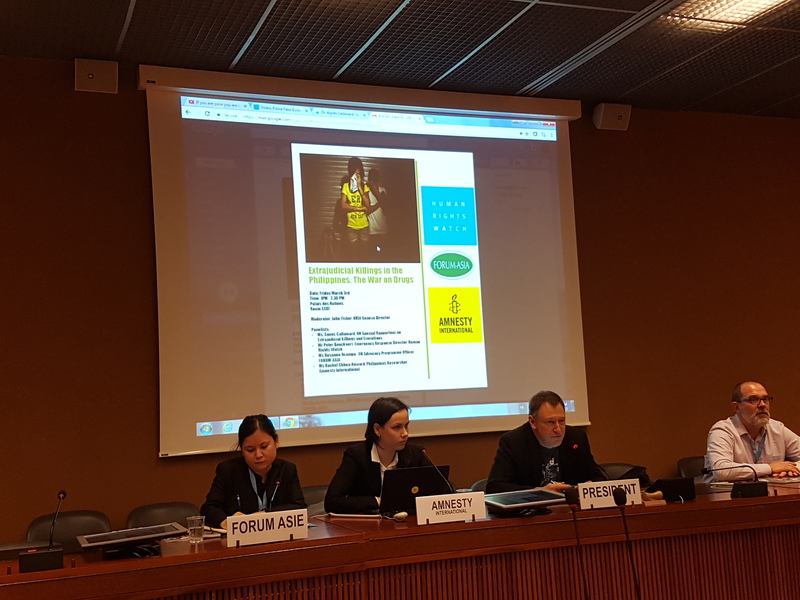 FORUM-ASIA organised a side event on threats against human rights defenders who are active online, with the participation of the Special Rapporteur on the situation of human rights defenders, and defenders from Bangladesh, Burma/Myanmar, Pakistan, and Thailand. It also co-sponsored a side event on backsliding on civic space in democracies, in which the Special Rapporteur on the situation of human rights defenders spoke. Furthermore, FORUM-ASIA organised a consultation between Asian human rights defenders and the Special Rapporteurs on human rights defenders; freedoms of peaceful assembly and of association; and freedom of religion or belief. The report on Timor-Leste’s Universal Periodic Review (UPR), in which the state accepted 146 out of 154 recommendations, was adopted at this session. FORUM-ASIA delivered a statement calling on the government to amend the media law in line with the International Covenant on Civil and Political Rights (ICCPR) and review legislation that place undue restrictions on freedom of expression. On the area of transitional justice, FORUM-ASIA called on the government to ensure reparations and justice for victims of past human rights abuses. FORUM-ASIA looks forward to following developments on Timor-Leste’s implementation of UPR recommendations, in collaboration with all relevant government branches and ministries. It encourages the government to develop a concrete and time-bound follow-up plan in consultation with the national human rights institution and civil society organisations. During the general debate on the follow-up to and implementation of the Vienna Declaration and Programme of Action, FORUM-ASIA called on Asian NHRIs to strengthen and exercise their mandates to take pro-active action on protecting HRDs. It stated the failure of selection processes of NHRIs in Bangladesh, Burma/Myanmar, India, and Thailand to be transparent and participative. It urged Asian governments to follow a clear, comprehensive and consultative process that leads to open and merit-based selection, and called Asian states without NHRIs to take immediate steps toward establishing effective and independent NHRIs.